Joanna newsom is a genius. There, I said it. The G word. A proper, certified, unambiguous genius. There is no-one, but no-one out there (except perhaps Sufjan Stevens) who writes music so perplexing, so full of unexpected twists and turns, with lyrics so poetic and mysterious. She’s something of an enigma. After all, she’s also certifiably beautiful, graceful, whimsical, and more than a little bonkers. Comparisons with Kate Bush and Joni Mitchell are easy to make, but only tell about a hundreth of the story. This woman is once-in-a-decade special, and always a massive pleasure to watch live. What’s even more pleasurable is, having seen her play only her second London show, back in 2004, developing into such a stunning artist. 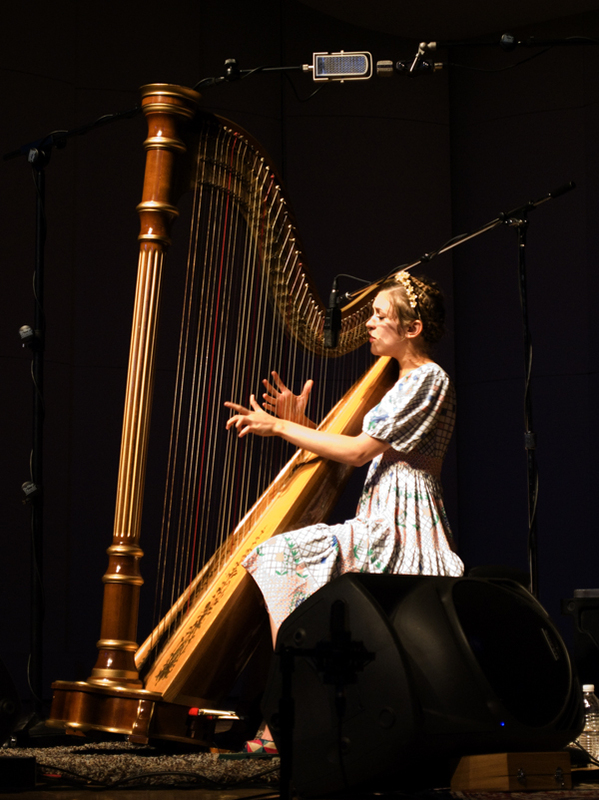 First time, in the Conway Hall, she was shy and self-effacing, just her and her harp. Now, she’s bantering with band and audience alike, demanding that we ask questions of the band whilst she tunes her harp (standout question – “What’s your opinion of the pedestrianisation of Norwich High Street”; this met with huge applause from the crowd and an exasperated “We’re sitting ducks up here!” from the drummer Neal). Her music has developed exponentially too; from the relative simplicity of “The Milk-Eyed Mender” through the stunning “Ys”, to this year’s baffling, astounding, and undoubtedly soon-to-reach-modern-classic-status-once-we’ve-all-listened-to-it-100-times “Have One On Me”. Given that the new one has 18 tracks, some of which are about an hour long, it’s no shock that tonight’s set is taken mainly from it. This does pose something of a problem, in that this is an album that clearly needs about a year of solid listening to make sense, but this isn’t stopping our old Joanna. The easier tracks, like, er, “Easy” and “Good Intentions Paving Company” (if that’s not song title of the year I want to know what is) are more easily digestible, and met with rapturous applause. Some of the tougher songs still get the crowd going, but you can tell that we’re all still a bit confused. Earlier songs are given a tasteful wash and brush up. “The Book Of Right-On” maintains its air of tentative flirtatiousness, with the band adding beautiful touches here and there. And “Inflammatory Writ” has become much more delicate, and a far better song as a result; I’d love to have that on another “Ys Street Band” EP. The work she has done with the band has worked wonders for the show; she is blazingly confident, and with good reason. Sadly, there’s no space for easy-going crowd favourites “Emily” or “Bridges And Balloons” (as if a nine-minute long song, and one about bleedin’ Narnia, can be classified as “easy-going”), both of which were yelled out by crowd members as the band returned for the single encore. “Excellent choices”, Joanna replied, “But we kind of have our own plan”. Spoken without a hint of apology, there’s a determination in the subtones of her voice that show you exactly what a fiercly ambitious and hugely intelligent musician she is. For she truly is a special talent. How the hell does she memorise all these songs, let alone remember the lyrics? Whilst I know I’ve gone on about Mew or Russian Circles in the past, but Joanna really is in a different league in the challenging yet accessible music stakes. She even got a London crowd – normally filled with morons yapping to each other about a scarf they had seen in a boutique in Hoxton – to shut up. Now that’s genius. Note: Apologies for the somewhat slapdash post. Normal over-verbose service will be resumed once Real Life buggers off to its hole.